NETWORK FINALS: BIG BROTHER gained 0.1 in final numbers. In addition, both episodes of THE CARMICHAEL SHOW (new and rerun), both reruns of THE GOLDBERGS and the 10PM MODERN FAMILY lost 0.1. CABLE HIGHLIGHTS: It was soccer narrowly over sharks on Wednesday cable, as Fox Sports 1’s coverage of the CONCACAF GOLD CUP match led at 0.71. (Univision’s Spanish-language telecast was at 0.28.) Discovery’s SHARK WEEK continued with DEVIL SHARKS at 0.70, THE LOST CAGE at 0.69, and SHARK AFTER DARK at 0.39. 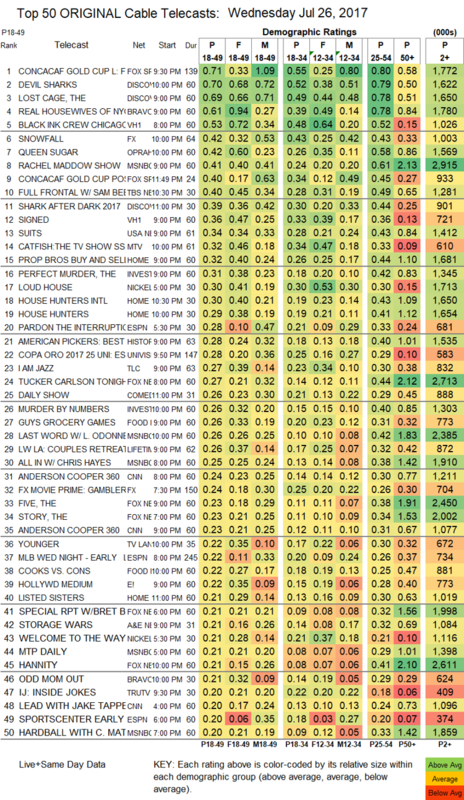 On Bravo, REAL HOUSEWIVES OF NYC ticked down to 0.61, and ODD MOM OUT held at 0.21. VH1’s BLACK INK CREW rose 0.08 to 0.53, and served as the lead-in to SIGNED at 0.36. FX’s SNOWFALL dropped 0.04 to 0.42. OWN’s just-renewed QUEEN SUGAR fell 0.05 to 0.42. MSNBC’s RACHEL MADDOW SHOW was the #8 original of the day at 0.41/2.9M, ahead of Fox News’s TUCKER CARLSON TONIGHT at 0.27/2.7M, and CNN’s ANDERSON COOPER 360 at 0.24/1.2M. TBS’s FULL FRONTAL slipped 0.02 to 0.40. USA’s SUITS lost 0.02 to 0.34. On MTV, CATFISH took a 0.14 hit to 0.32. On HGTV, PROPERTY BROTHERS dropped 0.04 to 0.32, HOUSE HUNTERS INTL shrank by 0.11 to 0.30, and HOUSE HUNTERS was down 0.11 to 0.29. On ID, THE PERFECT MURDER climbed 0.07 to 0.31, and MURDER BY NUMBERS was down 0.02 to 0.26. Nickelodeon’s afternoon LOUD HOUSE was at 0.30. On TLC, I AM JAZZ gained 0.02 to 0.27, and HAIR GODDESS ticked up to 0.14. Food Network’s GUY’S GROCERY GAMES was at 0.26, and COOKS VS CONS ticked up to 0.22. On Lifetime, LITTLE WOMEN: COUPLE RETREAT arrived at 0.26, and SO SHARP premiered at 0.10. TV Land’s YOUNGER rose 0.04 to 0.22. 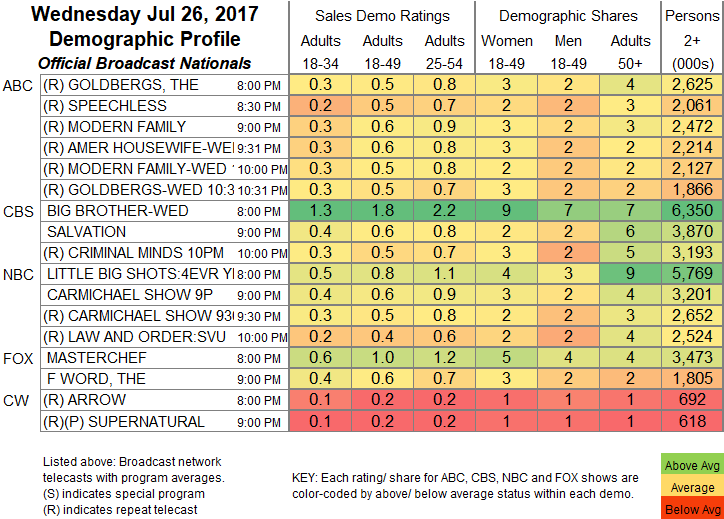 E!’s HOLLYWOOD MEDIUM fell 0.08 to 0.22. A&E’s STORAGE WARS ticked up to 0.21. On Tru, INSIDE JOKES dropped 0.03 to 0.20, and I’M SORRY was down 0.02 to 0.13. Comedy Central’s HOOD ADJACENT lost a tick to 0.13. Syfy’s BLOOD DRIVE fell 0.02 to 0.11. Off the chart, BBCAmerica’s BROADCHURCH was steady at 0.04/276K, POP’s NIGHTCAP held at 0.02/99K, and Sundance’s CLEVERMAN remained at 0.02/62K.